Shannon Bennett’s insatiable search for perfection comes at a price that ultimately is relative to the overall level of experience offered. The $10m move to Rialto guarantees a ‘Lamborghini’ style view, although given the package was already stellar, this latest makeover is somewhat akin to adding white truffles to foie gras, for previous devotees. Not that I am complaining, and given it was recently awarded Restaurant of the Year, clearly no one else is either. The reinvented Vue de Monde strikes the right balance between big-ticket destination dining whilst still offering an evolving culinary journey for those who have followed this prodigiously talented Chef since his early days in Carlton, and then at Little Collins Street. Sharing the 55th level above street level, with its glam Lui Bar, the L-shaped seating plan optimises the view, whilst also assisting in noise buffering and adding a degree of intimacy to the room. The adjacent Bar and viewing platform is only a factor on entry, or when sharing the toilets; otherwise they exist as separate entities, even sensibly having separate lifts allocated. Massive well-spaced kangaroo hide covered tables instantly win me over, with the configuration of curiously arranged river stones systematically moved during the night; each serving a very unique purpose. Poetic hundred year old Penfolds vines are stunning as cutlery holders, and the Melbourne Design Award winning Ross Didier kangaroo pelt chairs are not only stylish, but immensely comfortable to say the least. 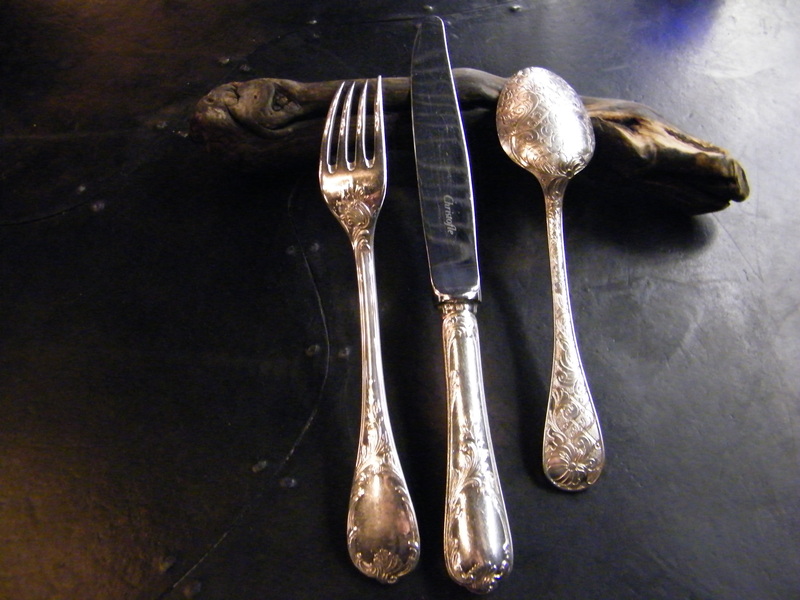 A diverse array of amuse served on various materials are playful, and a quirky touch, although there is no mistaking the level of technique and execution underpinning them. 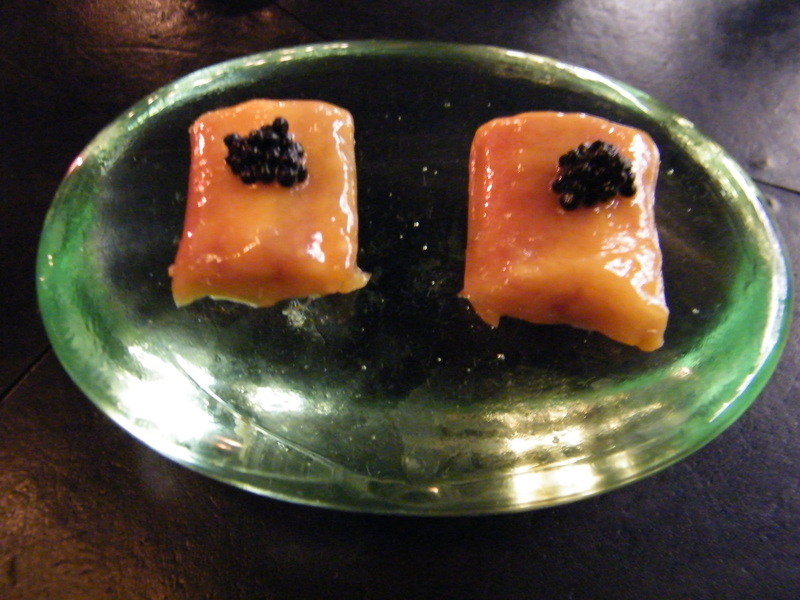 Delicate wafer thin parsnip chips, oyster paste in translucent gelatin ravioli, sublime rolled salt cured wallaby with wasabi, perfect triangles of celeriac and sunflower seed paste, and smoked eel with white chocolate and caviar, all deliver that intangible ‘wow’ factor. A variety of breads served in a leather pouch, with heated stones and a quenelle of French Beurre Echire butter, on you guessed it, its own dedicated stone that has been custom hollowed for that exact purpose. 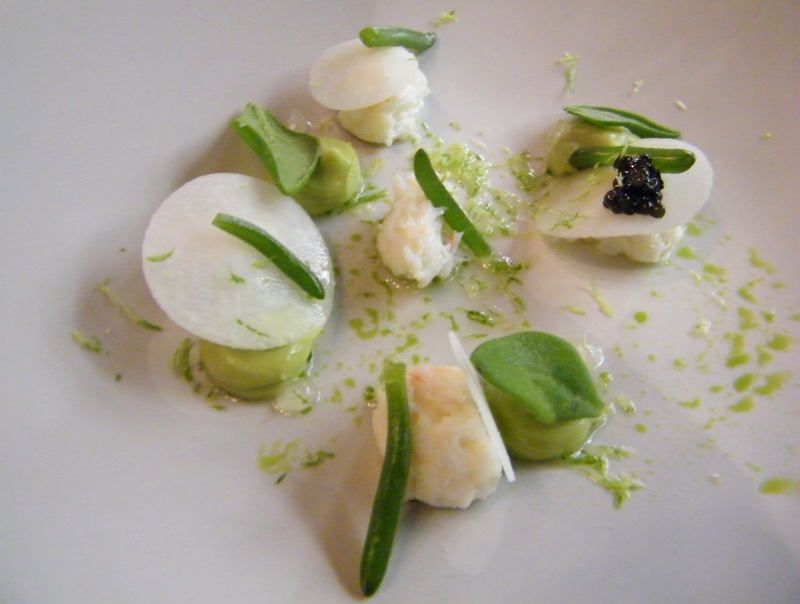 The delicate flavour of spanner crab, with dabs of velvety avocado puree, is stunningly plated and showcases the produce with the kohlrabi and beach herbs adding contrast, whilst not overcomplicating the sheer lightness of the dish. Lightly poached marron, flashed in a pan with butter, is a dish of so few elements, yet capable of inducing a myriad of sighs. 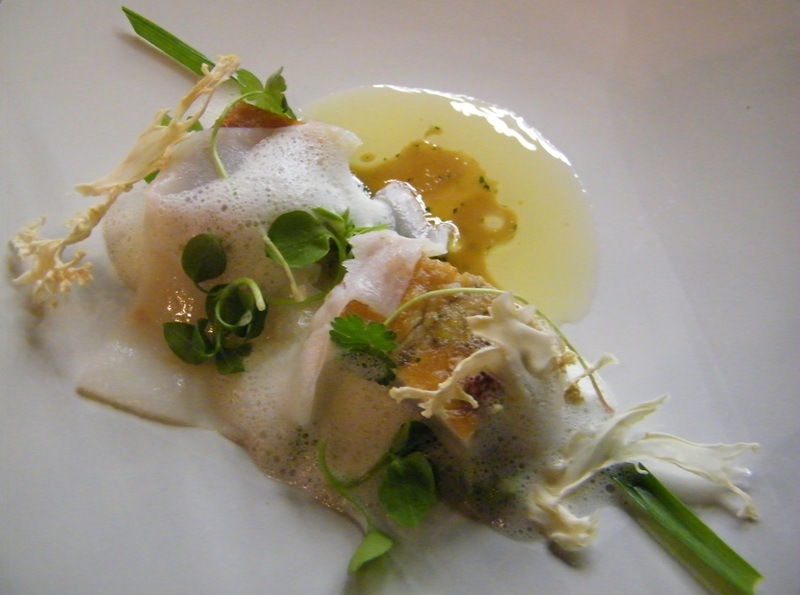 All the variations of this dish have developed a very strong following and for good reason. 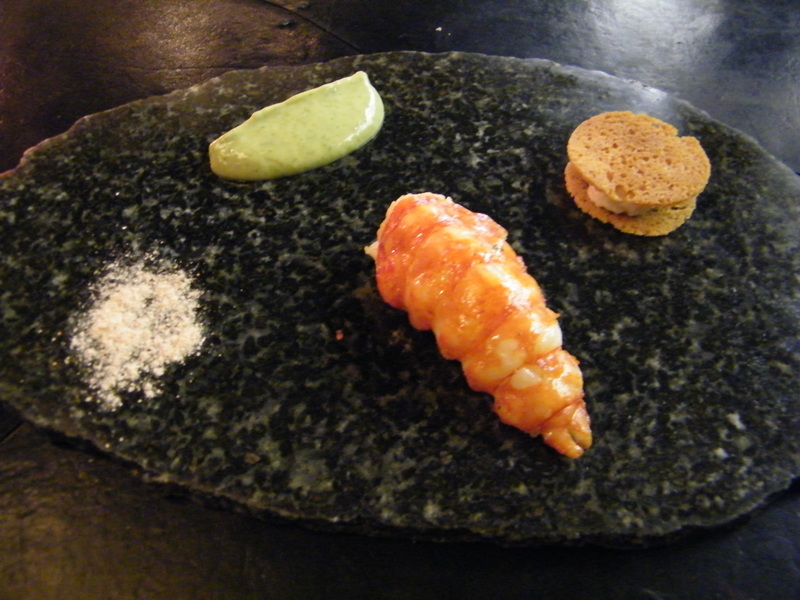 Not served with cutlery, the initial bite, after dipping the marron in the tarragon butter and marron salt, is simply textural perfection, let alone flawless in both flavour and balance. Quite an elaborate cona infusion of earthy field mushrooms is performed and poured tableside over delicate gnocchi that not only provides incredible aromatics, but lovely nuance from primarily not being overworked. “Good morning” is the greeting at around eight pm and we are told it is time for breakfast, which is a very sophisticated take on eggs with toast, with an exquisitely slow cooked and oozy duck egg, croutons, delectable lamb sweetbreads, pickled and fried onions, and a very healthy dose of shaved truffle. 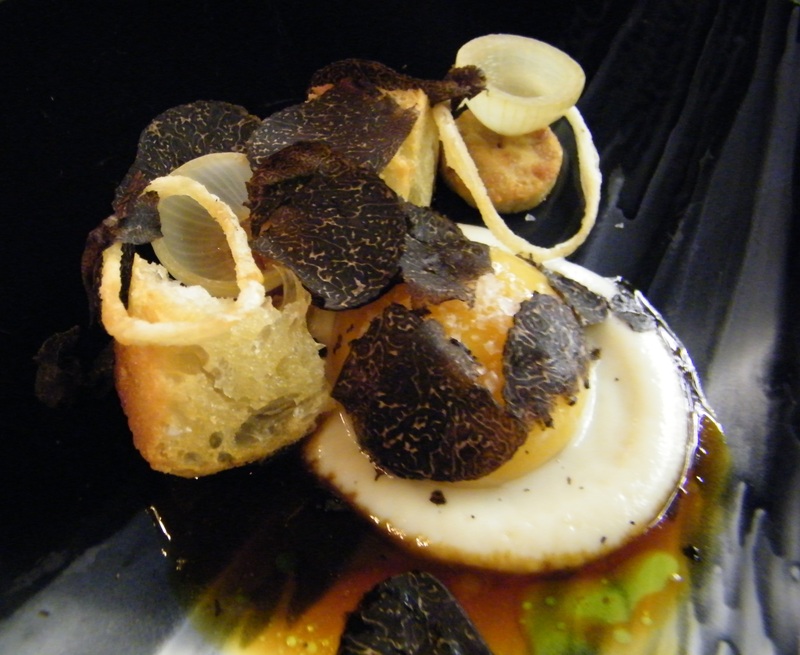 The dish is served with a refined but intense reduction, but the overall toasty back note picks up on the decadent 2003 Dom Perignon match-up nicely. The following course in contrast sees liquid nitrogen poured over fresh herbs in a mortar, instantaneously dried from the reaction and then ground by the diner with a pestle, before a smashing cucumber sorbet is added tableside that amounts to a lot more than just pure theatre. The intensely flavoured wild caught Barramundi is seasoned well, with the textbook seared skin providing a nice textural element, finished nicely with a vibrant herb emulsion, prawn and smoked bone marrow. Then a hay smoked pigeon, where the numerous misses from that technique elsewhere are erased, for clearly it is discernible and executed to meaningful effect here. A nice ratio of fat from such a small bird delivers richness, particularly the moreish leg with artichoke, mushroom and parsley; both complimenting and cutting across that aspect. Talented and affable Head Chef Cory Campbell arrives at the table and declares it time to “crack out the tinnies” for a barbie, something I am always up for! However, on this occasion sous-vide Blackmore Wagyu is lightly smoked and astutely finished tableside, sending all future expectations soaring to lofty levels for this favourite national pastime. The cheese trolley, sadly near extinction, is revived and paid proper homage, giving the service not only a sense of theatre, but genuine anticipation as it is worked around the room. Select your own, or be gently coaxed, either way it is a wonderful time-honoured interlude between savoury and sweet that is done here with real sense of panache. A passionfruit beer shooter, with licorice and coconut sorbet balls, is a light yet effective palate cleanser. It is a first when the Tea Sommelier makes his introductions just prior to dessert. Totally passionate about his craft to the point of obsession, he approaches the ceremony with the fervour and dedication of an artisan. In fairness, the tea actually matches the course better than the sauterne, fully delivering on his pitch and leaving me with a fair old slice of humble pie. 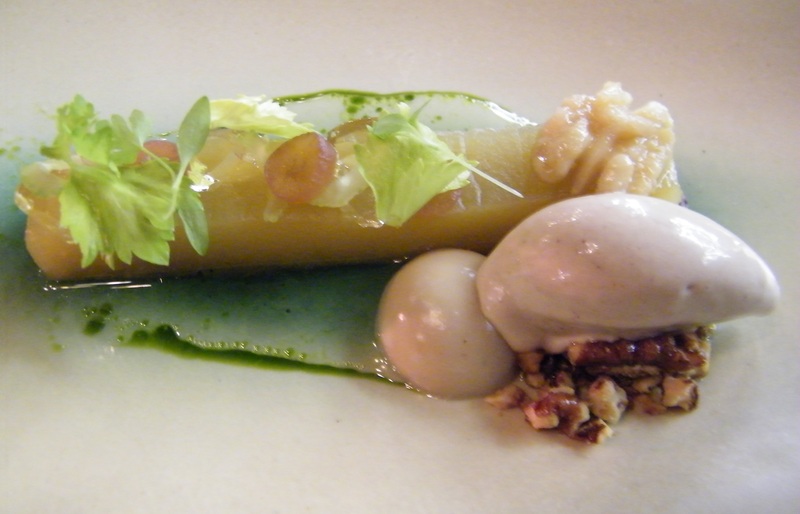 In reality, it is a superb apple terrine with walnut ice cream, caramelised apple and celery (yes celery), but you get the point. 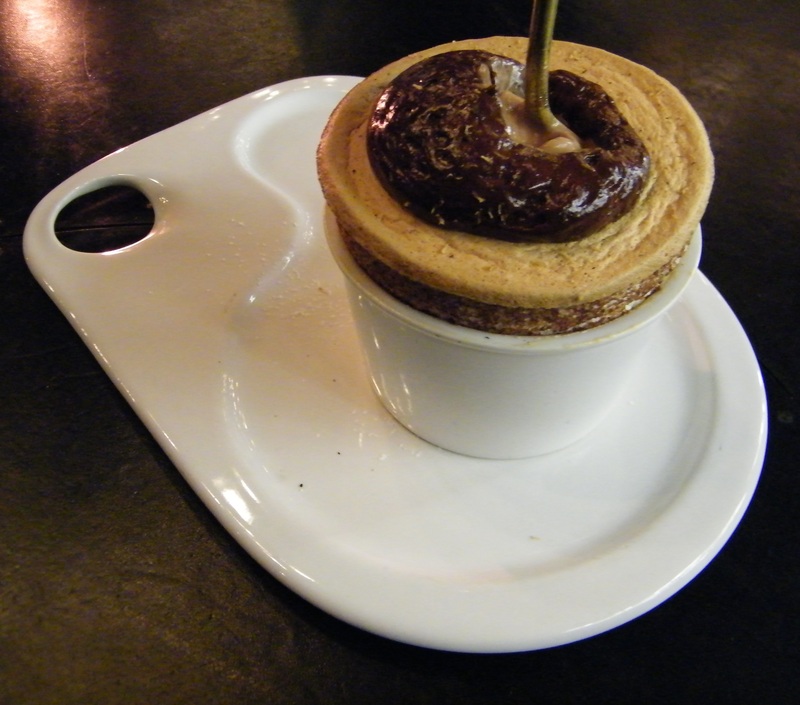 Not so left field, and a little more old school, is the matched Quinta do Noval Tawny with the far richer tonka bean soufflé, and smoked cocoa ice cream. Then a random square of the untouched bush floor is transformed into an edible memory of our childhood, in perhaps a playful yet entirely thoughtful take on our past food culture. These native Australian petit-fours, touchingly jingoistic and tongue in cheek, come with cherry and chocolate mousse lamingtons, and a two-up board replete with edible pennies, in that spirit. The most notable change, apart from the breathtaking view, is the paring back of the traditional formality for a far more engaging interactive experience between chefs and diners, with the usual silky service experience sitting in and around that ‘Noma’ style tweak, like a hand in a velvet glove. The optional premium matching wine package has also kicked up a gear, and rightfully so at around $25 per course ($15 standard) with the odd blockbuster thrown in to make the upgrade worthwhile. Was the move to Rialto entirely necessary? 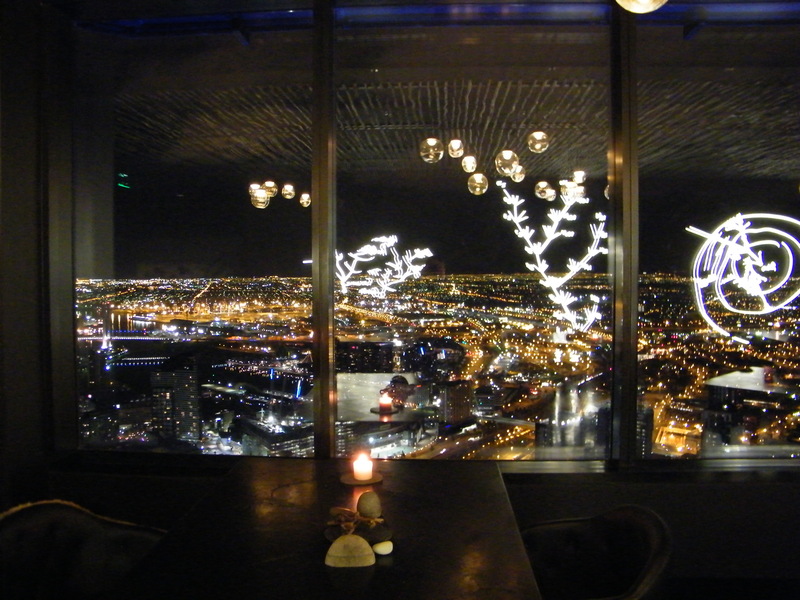 Probably not, but Vue de Monde has to be commended in forever chasing the perfect dining experience, especially in a climate clearly not conducive to such Quixotic pursuits. I find it particularly refreshing, judging from the bustling dining room tonight, that diners are equally prepared not to surrender on those worthy ideals lightly, and are prepared to support a World class restaurant that is measurably closer to that elusive goal than most. Thanks for your very kind words. Vue, for me, is without peer in this country so I hope your experience will be as good as mine have all been at Shannon’s wonderful culinary playground. I was totally blown away when we visited VDM on our last visit to Melbourne. 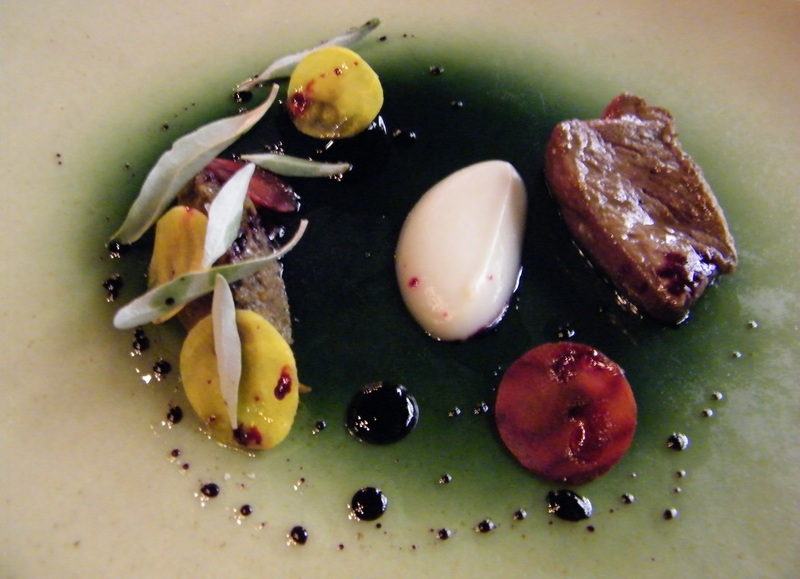 Shannon Bennett’s creativity is quite spectacular and looks like you had totally different dishes from what we had. Awesome pics too! Thanks kindly for leaving your comments which are spot on. I was saying recently that when I go to Vue I expect to be amazed, moved and inspired, and each and every time Shannon’s team manage to do exactly that.